Cathryn Forrester is a medieval business woman, the daughter of a successful wool merchant. She has been groomed from a young age to take over the family business, and has been quite content to let her personal life be directed by what is best for the business – including whom she will marry. And as a calmly pragmatic, infuriatingly stubborn and altogether practical young woman, this suits her just fine. She does not believe in love, after all. So when Cathryn meets Favian Drake, a man who knows that love is worth pursuing, her ideas about love and marriage are put to the test. But Cathryn faces her greatest challenge when she discovers that Favian is not exactly who – or what – he appears to be. 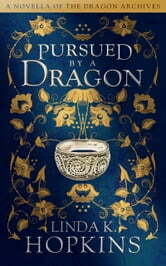 Can she learn to trust her heart and allow herself to love a dragon? This short novel is the second book in The Dragon Archives series, and predates Book I. Although this is the second book in the Dragon Archives, I would recommend reading it first if you don't want to interrupt the flow of the storyline about Kiera and Aaron which continues in book three. Once again with such wonderful characters you cannot help but get drawn in and I found myself trying to tell them what to do as I feared things were not going the way I wanted! Very enjoyable. I thought the book was very well written i have now completed all four books and am waiting for the next edition.hopely it wii come out soon.